These book reviews are all from books that are on my office bookshelf, the books I read about biology. 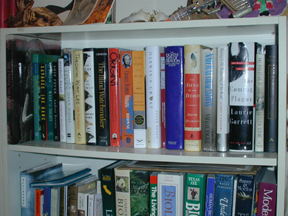 The books selected by me for my bookshelf are not technical references about biology per se. Rather, they are books where biology provides not the subject so much as the frame. Some are about research being done, others about current issues where biology plays a key role, and many of them are novels or other works of fiction in which biology plays an interesting role. My hope is that these reviews will help people find a new book that they enjoy. THE BEAK OF THE FINCH Jonathan Weiner. Alfred Knopf, New York, 1994. BEING DEAD Jim Crace. Farrar, Straus and Giroux, New York, 1999 [IBSN: 0-312-27542-0]. THE BLANK SLATE Steven Pinker. Viking, New York, 2002 [ISBN 0-670-03151-8] 509 pp. THE BLIND WATCHMAKER Richard Dawkins. Norton, New York, 1986. THE BOTANY OF DESIRE: A PLANT’S-EYE VIEW OF THE WORLD Michael Pollan. Random House, New York, 2001 [IBSN: 0-375-50129-0]. CHARLES DARWIN VOYAGING Janet Browne Princeton University Press, Princeton, New Jersey, 1995 (printed as a paperback in 1996). THE COMING PLAGUE Laurie Garrett. Farrar, Straus and Giroux, New York, 1994. DARWINS DREAMPOND Tijs Goldschmidt. MIT Press, Cambridge, Massachusetts, 1998. DARWINS GHOST Steve Jones. Random House, New York, 2000. THE DEMON IN THE FREEZER Richard Preston. Random House, New York, 2002 [ISBN 0-375-50856-2] 238 pp. DIGGING DINOSAURS John Horner and James Gorman Harper & Row, New York, 1988 (printed as a paperback in 1990). DRIVING MR. ALBERT Michael Paterniti. Random House, New York, 2000. THE EIGHTH DAY OF CREATION Horace Judson. Simon & Schuster, New York, 1979. EINSTEIN’S DREAMS Alan Lightman. Warner Books, New York, 1994. THE END OF THE GAME Peter Beard Chronicle Books, San Francisco, 1963 (revised and reprinted in pa-perback, 1988). THE ETERNAL FRONTIER Tim Flannery. Atlantic Monthly Press, New York, 2001 [IBSN: 0-87113-789-5]. THE EVOLUTION OF JANE Cathleen Schine. Houghton Mifflin, New York, 1998. GENOME Matt Ridley. HarperCollins Publishers, New York, 1999. GERMS: BIOLOGICAL WEAPONS AND AMERICA’S SECRET WAR Judith Miller, Stephan Engelberg, and William Broad. Simon & Schuster, New York, 2001 [IBSN: 0-684-87158-0]. GUNS, GERMS, AND STEEL Jared Diamond. Norton, New York, 1998 (printed as a paperback in 1999). HOPE IS THE THING WITH FEATHERS Christopher Cokinos. Warner Books, New York, 2000 [IBSN: 0-446-67749-3]. THE HUNTER Julia Leigh. Four Walls Eight Windows Publ., New York, 2000 [IBSN: 1-56858-169-6]. IN SEARCH OF DEEP TIME Henry Gee. Free Press, New York, 1999. THE ISLAND OF THE COLORBLIND Oliver Sacks. Random House, New York, 1998. KRAKATOA Simon Winchester. HarperCollins, New York, 2003 [IBSN 0-06-621285-5] 416 pp. LONGITUDE Dava Sobel. Walker Publishing Company, New York, 1995 [ISBN: 0-8024-1312-2]. MENDELS DWARF Simon Mawer. Crown Publishers, New York, 1998. THE MONK IN THE GARDEN Robin Marantz Henig. Houghton Mifflin, Boston, 2000. MR DARWINS SHOOTER Roger McDonald. Atlantic Monthly Press, New York, 1998. NATURAL OBSESSIONS Natalie Angier. Houghton Mifflin, Boston, 1988. THE ORCHID THIEF Susan Orlean. Ballantine Books, New York, 1998 (printed as a paperback in 2000). ORIGINS Robert Shapiro. Simon & Schuster, New York, 1986. ORYX AND CRAKE Margaret Atwood. Doubleday, New York, 2003 [ISBN 0-385-50385-7] 376 pp. PATTERN RECOGNITION William Gibson. Putnam, New York, 2003 [ISBN 0-399-14986-4] 356 pp. THE PEPPERED MOTH Margaret Drabble. Harcourt, Inc., New York, 2001 [IBSN: 0-15-100521-4]. THE PLEASURE OF FINDING THINGS OUT Richard Feynman. Perseus Publishing, New York, 1999 [ISBN: 0-7382-0349-1]. THE POPE’S RHINOCEROS Lawrence Norfolk. Henry Holt, New York 1997. A RUM AFFAIR Karl Sabbagh. Farrar, Straus & Giroux, New York, 2000. SAVAGES Joe Kane. Random House, New York, 1996. SHIP FEVER Andrea Barrett. Norton, New York, 1996. A SHORT HISTORY OF NEARLY EVERYTHING Bill Bryson. Broadway Books, New York, 2003 [IBSN 0-7679-0817-1] 544 pp. THE SKEPTICAL ENVIRONMENTALIST Bjorn Lomborg. Cambridge University Press, New York, 2001 [IBSN: 0-521-01068-3]. THE SONG OF THE DODO David Quammen. Scribner, New York, 1996. SUMMER FOR THE GODS Edward Larson. Harper Collins, New York, 1997. THROWIM WAY LEG Tim Flannery. Atlantic Monthly Press, New York, 1998. TRILOBITE! Richard Fortey. Alfred Knopf, New York, 2000 [ISBN: 0-375-40625-5]. WEST WITH THE NIGHT Beryl Markham. North Point Press, San Francisco, 1942. (reprinted as a paperback in 1983). WHERE DARWIN MEETS THE BIBLE Larry Witham. Oxford University Press, New York, 2002 [ISBN 0-19-515045-7] 338 pp.